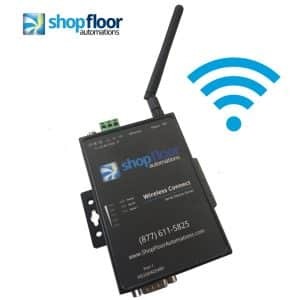 Through Wireless Connect solutions, add wireless to CNC machines with SFA’s industrial grade wireless devices with quick installation to connect to your CNC machines. Consumer level devices, like DLink or Netgear products, cannot withstand the manufacturing environment. Our products allow you to connect your RS232-based machines to your existing wireless network & we can even help if you lack an existing wireless network! The Wireless CNC Adapter acts as an interface between any CNC control with an available RS232 or Ethernet port. The machine tool control can send from CNC memory to the Adapter, Adapter to CNC memory or drip-feed (DNC) from the Wireless CNC Adapter. The extended antenna allows for the unit to mounted internally or externally on the machine and powered by various power sources. The Wireless CNC Adapter is available as 1 or 2 port and comes with a lifetime warranty and includes a serial cable for the specific machine. The advantage of using the device delivers high-speed communication to the CNC controller while using 802.11B/G wireless technology. The unit supports various encryption standards and has a web-based interface for quick programming. Add Wireless to your CNC. Call (877) 611-5825 for more info!